Ok so you have a big bag, tent etc to fix to your bike without causing damage. This where ROK Straps come into their own. For over 30 years I have used bungee hooks with success but sometimes they have let go from not being hooked on properly and have whipped me, cut my hands and scratched the bikes I have owned. I found you need the right length bungee to do the job and you never seem to have it. A friend of mine suggested ROK Straps and showed them to me in the accessory department at a bike shop, so I bought a pair of 42" straps in black. Because I have the luxury of my 'adapted' Ventura rack I am spoilt for choice as to where to loop each separate end of the straps. You simply feed the loop round a bar and thread the other part of that strap through the loop and pull tight, that's it. You do just the same for the other part of the strap. Then simply put your bag on the bike, connect both parts of the straps together with a reassuring click and then pull tight until you feel the elasticated part near to the end of its limit. The elasticated end looped around the rack. Because I had to secure quite a large bag to my rack I bought two more 42" black straps so there are four to do the job now and they do it very well. I was impressed so much by these I bought two more in green in the smaller size (can't remember what it is but about 24" or 26") and these secure my tent separately on the rear of the rack, see the pics. ROK STRAPS! I wouldn't go back to using elasticated cords now I have these. 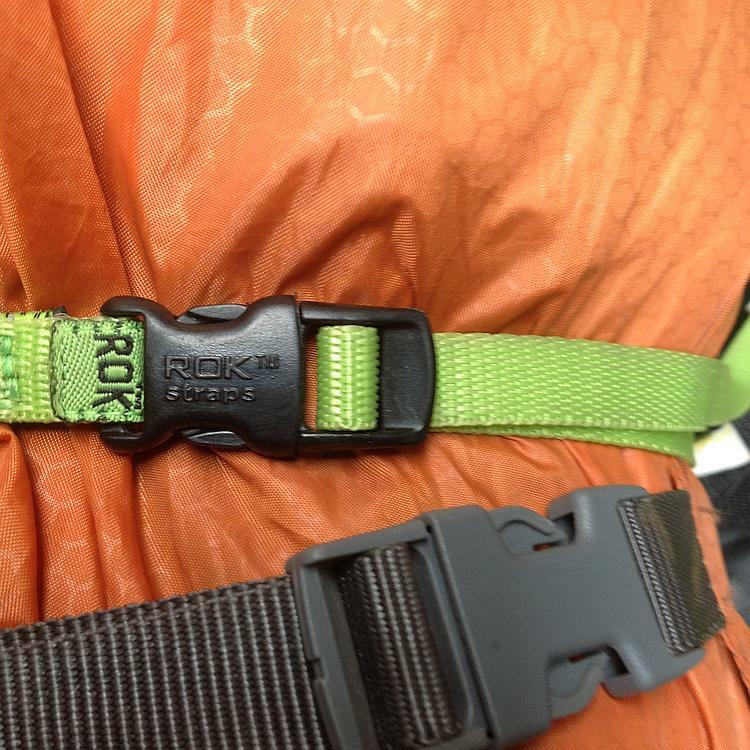 I had never heard of rok straps until 6 months ago. When I started my new job they used these for fastening 65 to 70" tv's to the inside of large carrying boxes. I thought they were specifically designed by the company I never knew you could buy them off the shelf. They are tough yet springy and offer some shock protection for the tv's and never seem to loosen off unless you want them to. Never used them as my luggage has generally been of the hard variety but they must be an improvement over the conventional elastics which have a great probability of gashing your hands or worse. Bought a set after reading Stephen's review about them. Sounds a lot better than bungee cords. Might get some more for the quad as well once I try them out. Bungees are a lot cheaper but they wear out quickly and as he said you have to buy different sizes to secure stuff correctly. Let us know how your get on Borsuk. 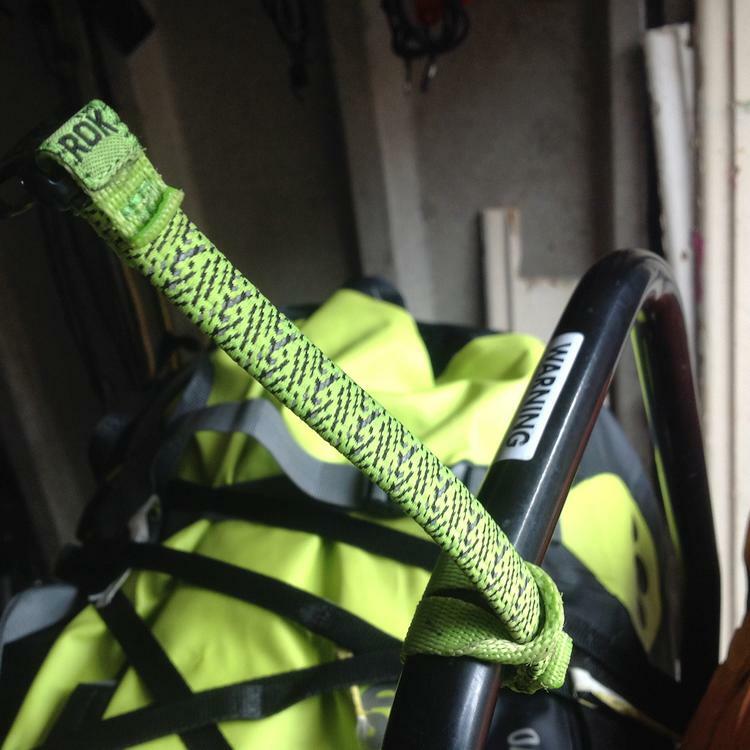 I had a play with Latchy's ROK Straps last week. They're actually a lot lot smaller than I thought and the plastic clip did not look sturdy enough. I did give it a good pull to no effect and Latchy assures me it's more than up to the task. I might buy a pair and give 'em what for.